Ecobags, Ecotubes and Ecoboxes as alternative solution for coastal protection or temporary marine structures. There is a noticeable trend in the market towards sustainable development, and an increasing demand for structures to be designed and constructed using alternative, sustainable methods. 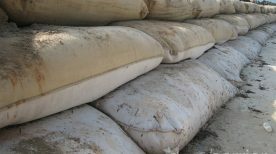 Geosynthetic containers have been used as an alternative, sustainable solution for coastal protection for more than 50 years. They have a smaller footprint and lesser impact on the environment than hard structures, such as rock and concrete, and are fabricated using specially engineered materials, to meet durability and environmental requirements. They also have proven to be time and cost saving, easy to install and remove for a variety of shoreline, onshore and offshore projects. An alternative solution for coastal protection or temporary marine structures. A leader in alternative, sustainable solutions.